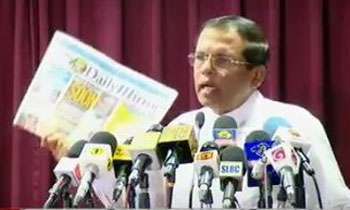 President Maithripala Sirisena said today the late Ven. Maduluwawe Sobitha Thera, who came forward to set up a Government through a common candidate, never asked a common candidate to loot the Central Bank. The President expressed these views at the 76th commemoration of the late Ven. Sobitha Thera held at Foundation Institute in Colombo. “I had not received an official invitation to attend the event. I came to know about it through a third party. My media director said the event was organized by Ravi Jayawardene. I contacted him and asked about my omission. He said there had been a mistake. Everyone had hoped I would be invited but no one took the initiative to do so. I brought today’s Daily Mirror newspaper along with me. It has posted a photo of me and Malaysian Prime Minister Mahathir Mohamad saying that I have not done what he has done in five days. It says Malaysian Prime Minister has arrested nine ministers, 144 businessmen and 50 judges accused of corruption. I phoned Malaysia and our High Commissioner in Malaysia and they said these claims are all false. Social media also critisised me me in the last few days saying I have not done what Mahathir took five days to accomplish. I am a person who came forward to make this country better and carry out the principles of good governance in its true sense. I could have earned huge sums of money when I was the Health Minister if I wanted to. I am truly hurt by the wrong interpretations that has been formed in the minds of the public about me. I am taken aback when I hear things such as the fact that cases against wrongdoers are not being taken up because of me. People never expected an investigation to be launched into allegations that former Minister T.B. Ekanayake gave a vehicle to someone, former Deputy Minister Priyankara Jayaratne giving a job to his daughter and former Minister A.H.M. Fowzie misusing a vehicle belonging to another ministry. People in this country did not expect such behaviour from their public representatives. If family members of murdered rugby player Wasim Thajudeen and lawyers appeared in his case were taken to one place and asked, they would reveal what had happened. Some people say if anyone contested the Presidential Election as the common candidate could have won. If so they could have done so. I was used as the common candidate as I was a clean politician and came forward as a lion despite life threats. These people came up with a One-hundred-day Programme, which didn’t include a dissolving of Government. If that programme was not in place, the main task available was to dissolve Parliament. The one-hundred-day programme was one of the silliest things ever undertaken by this government. Who provided helicopters to former President Mahinda Rajapaksa to go to Tangalle unharmed after the Presidential election results were announced? Was it me? No! It was so and so.